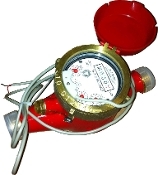 1 1/2" No Lead Hot Water Meter with 1 1/2" Male NPT Couplings. Ideal for 5 - 100 GPM flow rates on 1 1/2" water lines. Has 10 Gallon Pulse Output. Can be interfaced with an LCD remote. For domestic hot water use only. If the water temperature is above 160F, the meter must be installed horizontally with the register facing upwards.